Lord Sugar and his minions return to the UK tv screens 13/10/14 for the beginning of another series of the Apprentice. The BBC have started a drip youtube feed of the shows contestants aka candidates with sound bites for the couch potatoes that can’t understand the dialogue. You could say that the videos allow the candidates to express themselves but is it just another vehicle for bullying and ridicule prior to the show launch that they must endure? After we have all had a good laugh at their possibly lamentable claims we will see them face Lord Sugar and his bullying tactics according to The Guardian cribbing from the Radio Times. 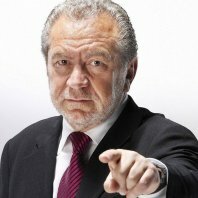 Lord Sugar says he just speaks as he finds and had he been a bully then he would have been inundated with tribunal cases, which he has not. Why they have chosen this over the dire quality of candidates would have nothing to do with an easy headline grab of course. It all begins with a series of videos that have been released which frame the candidate(s) in a noose of their own sound bites. The real question should be; has The Apprentice become an early season pantomime over the last few years or does it still offer something of value? In the interim, ready yourselves for a hoist of the petard(s).